I live in Delmar, NY and retired from New York State with 38 years, working mainly in Human Resources. 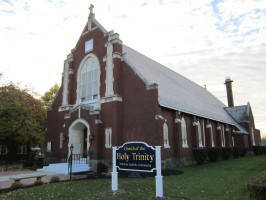 I have been a parishioner at Holy Trinity for 10 years and I have worked part time for 5 years as Parish Manager. Some of my duties are to meet regularly with the Pastor to update and brief on parish activities, approve purchases, execute regular bank deposits, supervise parish staff and maintain all personnel files.